Summary. Aim: To study the status of the tumor growth factor beta (TGFB) pathway in chronic lymphocytic leukemia (CLL) cells and to uncover molecular details underlying CLL cell genesis. Objects and Methods: The study was conducted on peripheral blood samples of patients with CLL using the following methods: RNA isolation, analysis of expression of transcription factors using RT2 profiler assay, bioinformatics analysis of publicly available data bases on expression. Results: We have shown that the TGFB — SMAD canonical pathway is not active in CLL cells. SMAD-responsive genes, such as BCL2L1 (BCL-XL), CCND2 (Cyclin D2), and MYC, are down-regulated in CLL cells compared with peripheral blood B cells of healthy donors. Conclusions: The TGFB-mediated signaling is not active in CLL cells due to low (or absent) expression of SMAD1, -4, -5, -9, and ATF-3. Expression and phosphorylation status of SMAD2 and -3 should be further elucidated in the future studies. Abbreviations used: ATF — activating transcription factors; BCR — B-cell receptor; CD — cluster of differentiation; CLL — chronic lymphocytic leukemia; IL — interleukin; ILR — interleukin receptor; INF — interferon; INFA — interferon alpha; INFG — interferon gamma; TNF — tumor necrosis factor; TNFA — tumor necrosis factor alpha; TGF — tumor growth factor; TGFB — tumor growth factor beta. Chronic lymphocytic leukemia (CLL) is represented by small B-lymphocytes, accumulating in bone marrow, spleen, lymph nodes and other tissues. B-cell count in peripheral blood in CLL can reach very high numbers, more than 5–10•106/ml . Noteworthy, CLL cells express various surface markers, characteristic for mature and/or naїve B cells, such as B-cell receptor (BCR), CD5, CD19, CD23 antigens, IgM/IgD etc. . However, in contrast to normal B cells, CLL cells can not be activated. Moreover, they are incapable to differentiate into plasma cells and do not produce antibo­dies . Therefore, it is widely accepted that CLL cells are immunologically incompetent mature B-lymphocytes. From other hand, CLL cells express a set of cytokine receptors, namely interleukin receptors, — IL-2R, -4R, -6R, -10R, -13R [4–7], and also receptors for tumor necrosis factor alpha (TNFA) [5, 8], interferon alpha (INFA)  and gamma (INFG)  and also for tumor growth factor beta (TGFB) . We have to mention, that CLL cells, despite being non-proliferating, secrete still many cytokines that are described above. One of the most important cytokines is TGFB, which has a dual role in carcinogenesis . In lymphoid cells the active canonical TGFB pathway leads to apoptosis. Hence, it was shown that activation of the TGFB pathway resulted in induction of pro-apoptotic BMF, BIM, and, as consequence, BAX . In Burkitt’s lymphoma cells, anti-apoptotic BCL2L1 (BCLXL) and BCL2 were downregulated upon the TGFB-pathway activation . However, in CLL cells, levels of BCL2 did not differ from normal peripheral blood B cells. We asked a question, what is the status of the TGFB pathway in CLL cells, with the aim to uncover molecular details underlying CLL pathogenesis. Clinical specimens. Samples of the peripheral blood from patients were obtained at the Department of Oncohematology of R.E. Kavetsky Institute of Experimental Pathology, Oncology and Radiobiology (IEPOR) of NAS of Ukraine (in the period 19.11.2014–31.12.2016). The study included 38 patients. Among them, CLL was diagnosed in 29 individuals, 4 persons had CLL of the mixed type, 1 patient had B-cell lymphoma, 1 — marginal zone lymphoma and 3 patients had T-cell lymphoma. The non-CLL cases will be analyzed individually in the future studies. The main types and cytological variants of lymphoid tumors were diagnosed, according to the WHO classification . Mononuclear cells were isolated from peripheral blood, using centrifugation with the Ficoll-Paque density gradient media. The cell content was usually high (80–99% of B-cells in a population of mononuclear cells in patients with CLL). For control, B lymphocytes were isolated from the peripheral blood of 3 healthy donors, using the Ficoll-Paque density gradient media to separate mononuclear cells with the following “rosetting” of T-cells by erythrocytes of sheep blood. All experimental work was performed, according to the protocols that have been approved by the Committee on Bioethics at IEPOR. Also, all patients were thoroughly informed about the study. RNA isolation and cDNA synthesis. CLL cells were isolated from peripheral blood of patients by gradient centrifugation using the Ficoll-Paque density gradient media. Cells were resuspended in TRIzol reagent (GibcoBRL, USA) and stored at −20 °C until further use. The total RNA was isolated, using the RNeasy Mini Kit (Qiagen Inc., Germany), according to the manufacturer’s instructions. The cDNAs were synthesized, using 2 μg of total RNA, M-MLV Reverse Transcriptase and RNAse inhibitor (Invitrogen, USA), according to the manufacturer’s protocol. Analysis of the transcription factors expression using RT2 profiler assay. The expression profile of 84 transcription factors was determined in duplets using two identical PARN-075Z plates. Along with positive and negative controls, a total of 96 genes were analyzed. The RNA mixture consisted of 25 μl (a half) of each RNA solution isolated from the sample. The control represented a mixture of RNAs isolated from the peripheral blood B cells of three healthy donors. q-PCR was performed, using 2 μg cDNA and the SYBR Green Master Mix (Thermo Fisher Scientific Inc., USA), on the PCR System 7500 (Applied Biosystem, USA). CT was not measured after 35 cycles. The obtained CT values were downloaded into the manufacturer’s website (Thermo Fisher Scientific Inc., USA) for the online analysis of the transcription factors expression. Bioinformatic data analysis. In order to analyze expression of genes at the mRNA level, a publically available data base Oncomine was used. This data base contains published data that have been collected, standardized, annotated and analyzed by Compendia Bioscience (http://www.oncomine.com, September 2017, Thermo Fisher Scientific, Ann-Arbor, MI, USA). A PARN-075Z platform was used to assess expression of 84 various transcription factors. A mixture of RNAs isolated from the peripheral blood cells of 38 patients was used to perform these experiments, in comparison with the RNAs mixture isolated from the peripheral blood B-lymphocytes of three healthy individuals. We have shown that the majority of TFs were downregulated, in patient mononuclear (presumably CLL) cells . For example, both MYC and NFkB1 genes were downregulated 3.26 and 4.23 fold, respectively. We also found that many genes, which are usually induced upon activation of the IL-2 — STAT5 pathway (Matveeva et al., 2017, submitted), were downregulated in CLL cells. We have shown that ID1, HIF1A, MCL1, BCL2, BCL2L1, and Cyclin D2 (CCND2) genes are expressed in CLL cells at lower levels than in B cells of healthy donors. These data suggest that the IL-2 — STAT5 pathway is inactivated in CLL cells, probably, due to the lack of STAT phosphorylation. Among other pathways that are crucial for regulation of B cell fate, very important is the TGFB signaling. Noteworthy, activation of the TGFB pathway in vitro did not lead to increased apoptosis in CLL cells, in contrast to the peripheral blood B cells . Moreover, TGFB is secreted by CLL cells and could be measured in patient blood sera. Of note is that the TGFB receptors (TGFBR) are expressed at the similar level in CLL cells and peripheral blood B-lymphocytes. It is known that the active TGFB ligand binds to homodimers of receptors, TGFBRI and TGFBRII . A tetramer of these receptors is formed then and auto-phosphorylated TGFBRII can transfer a phosphate group to TGFBRI starting the signal transduction through SMAD proteins (Fig. 1 , a, b). SMADs are homologs of D. melanogaster proteins, named Mothers against decapentaplegic (MAD). It was shown that mutations in MAD led to repression of the gene called Decapentaplegic (Dpp) in a fruit fly embryo. Dpp is a morphogen and is responsible for correct growth of many tissues in drosophila. The SMAD protein family consists of at least 8 members. SMAD1, -2, -3, -5, and -8 are regulatory proteins (R-SMADs) that could be phosphorylated . SMAD8 is encoded by the SMAD9 gene. 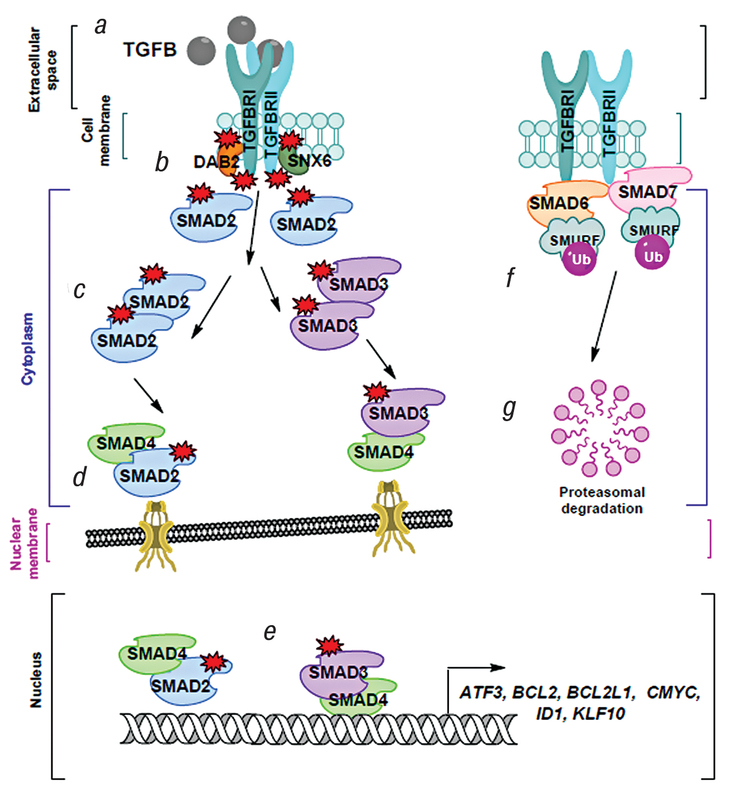 Importantly, only SMAD2 and SMAD3 function as R-SMADs in the canonical TGFB pathway (Fig. 1, c). SMAD4 (also called co-SMAD) forms the complexes with phosphorylated SMAD2 and SMAD3 (Fig. 1, d). These heterodimers, containing SMAD4, are imported to a nucleus, where they bind to DNA, together with other co-factors, and transactivate (or, alternatively, repress) a set of responsive genes, namely ATF3, ID1, CMYC, etc (Fig. 1, e). SMAD6 and SMAD7 are the inhibitory SMADs (I-SMADs). They can bind to a SMAD-specific E3 ubiquitin ligase SMURF (Fig. 1, f). Together, they form complexes with TGFBR that results in proteasomal degradation of the latter  (Fig. 1, g). Taking into consideration that the TGFB pathway might be inactivated in CLL cells, we assessed expression of several SMADs in CLL cells in comparison with the peripheral blood B cells. We have found that all the studied SMADs (SMAD1, -4, -5, and -9) were downregulated at the mRNA level in CLL in comparison with B cells (Fig. 2, a left panel). Noteworthy, SMAD1 and SMAD9 were hardly detectable; their expression was lower in CLL cells up to 20 folds (18.2 and 18.1, respectively). SMAD4 expression was diminished 1.6 fold and SMAD5 — 2.8 fold. 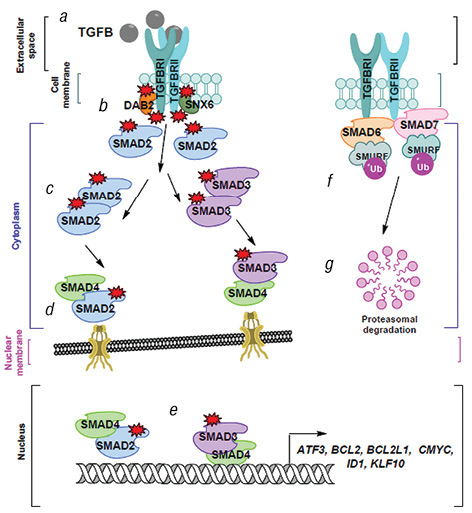 It is obvious to conclude that the alternative TGFB pathway, where SMAD1, -5, and -6 play an important role, could be inactivated due to low expression of these regulatory molecules. To corroborate our results, we have analyzed a set of the experimental data that have been published earlier and deposited to the Oncomine portal. SMAD1, -2, -5, -6, and -9 are expressed at very low levels in B cells (Fig. 3). Importantly, their expression at mRNA levels diminished further in CLL cells: almost 7 fold for SMAD1 , 2.5 fold for SMAD2 , 2.5 fold for SMAD6  and 2 fold for SMAD9 . The SMAD5 levels were similar in B and CLL cells, according to . SMAD3 and SMAD4 showed higher signals in B cells, compared with other SMADs, but their levels dropped dramatically in CLL cells as well: 6 fold for SMAD3  and 2.4 fold for SMAD4 . Importantly, these data are in concordance with the obtained in our study results. Thus, we were expecting that SMAD responsive genes will be not induced. As was mentioned above, expression of BCL2L1, CMYC, and ID1 genes were diminished in CLL cells compared with the peripheral blood B cells of healthy donors (Matveeva et al., 2017, submitted). 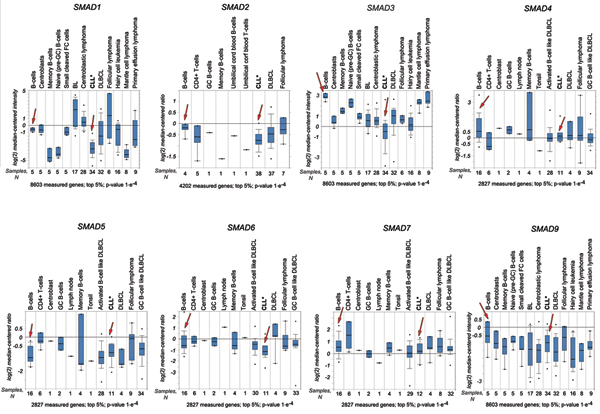 Expression of other SMAD-induced genes were also studied (Fig. 2, 4 and 5). Thus, members of a family of activating transcription factors (ATF), namely ATF3 and ATF4, were downregulated in CLL cells: ATF3 — 15.9 fold and ATF4 — 1.8 fold. 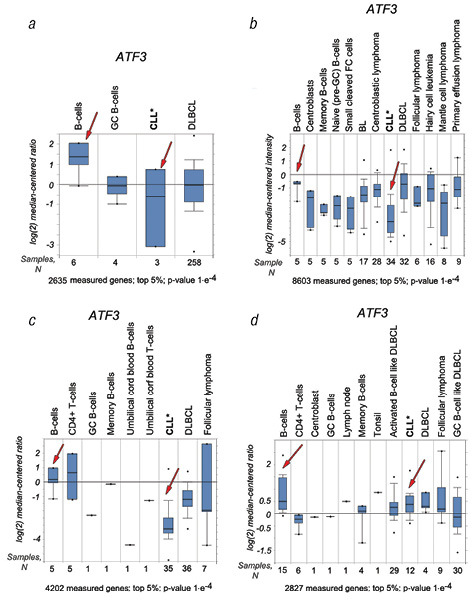 Expression of ATF1 was similar in CLL and B cells, and ATF2 was diminished in CLL cells; however, the differences were not significant (Fig. 2, the middle panel). Importantly, ATF3 should be induced by the active TGFB — SMAD pathway. 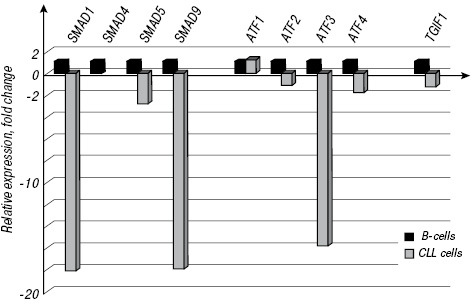 ATF3 can bind to SMAD2 and SMAD3, resulting in repression of the ID1 transcription . However, in our case, induction of ATF3 was not detected. Moreover, the analysis of the Oncomine data base corroborated our results (Fig. 4). Thus, the ATF3 expression was 6 fold (median value) lower in CLL. No big difference in expression of the TGFB-induced factor (TGIF1) was found in CLL cells (approximately 2 fold) (Fig. 2, the right panel). TGIF1 encodes another co-repressor of the SMAD2/3-dependent transcription . Of note, the levels of the TGFB-inducible early gene (TIEG, also called KLF10) were downregulated dramatically in CLL cells versus normal B cells (Fig. 5). Thus, expression was diminished 17 fold comparing with the published data [19, 20]. We have to mention that overexpression of KLF10 in pancreatic cancerous cells resulted in their apoptosis . Importantly, it was shown that expression of KLF10 is quite high in spleen and peripheral blood leukocytes compared to other tissues . Thereby, many TGFB — SMADs responsive genes are not induced in CLL cells. It can be due to the low expression of SMADs or the lack of their phosphorylation. We have found that the TGFB — SMAD2/3 pathway is not active in CLL cells. Expression of the SMAD genes were diminished in CLL cells compared with the peripheral blood B cells. Moreover, the TGFB — SMAD-responsive genes, namely BCL2L1 (BCL-XL), CCND2 (Cyclin D2), ID1, MYC, ATF3, TGIF1, and KLF10 (TIEG), are down-regulated in CLL cells as well. Why the TGFB — SMAD2/3 pathway is inactivated, it is an open question. Beside low expression of SMADs, there might be the lack of the SMAD2 and SMA3 phosphorylation involved. Expression and the phosphorylation status of SMAD2 and -3 should be further elucidated in the future studies. We thank Professor Danylo Gluzman (R.E. Kavetsky IEPOR of NAS of Ukraine) for the fruitful discussions over this manuscript. This work was supported by the Swedish Cancer Society, by matching grants from the Concern Foundation (Los Angeles, USA) and the Cancer Research Institute (New York, USA), and by the Academy of Science of Ukraine (grant No. 0112U002192). 1. Dighiero G, Hamblin TJ. Chronic lymphocytic leukaemia. Lancet 2008; 371: 1017–29. 2. Rothstein TL, Griffin DO, Holodick NE, et al. Human B-1 cells take the stage. Ann N Y Acad Sci 2013; 1285: 97–114. 3. Herishanu Y, Katz BZ, Lipsky A, Wiestner A. Biology of chronic lymphocytic leukemia in different microenvironments: clinical and therapeutic implications. Hematol Oncol Clin North Am 2013; 27: 173–206. 4. Trentin L, Cerutti A, Zambello R, et al. Interleukin-15 promotes the growth of leukemic cells of patients with B-cell chronic lymphoproliferative disorders. Blood 1996; 87: 3327–35. 5. Reittie JE, Yong KL, Panayiotidis P, Hoffbrand AV. Interleukin-6 inhibits apoptosis and tumour necrosis factor induced proliferation of B-chronic lymphocytic leukaemia. Leuk Lymphoma 1996; 22: 83–90, follow 186, color plate VI. 6. Fayad L, Keating MJ, Reuben JM, et al. Interleukin-6 and interleukin-10 levels in chronic lymphocytic leukemia: correlation with phenotypic characteristics and outcome. Blood 2001; 97: 256–63. 7. Chaouchi N, Wallon C, Goujard C, et al. Interleukin-13 inhibits interleukin-2-induced proliferation and protects chronic lymphocytic leukemia B cells from in vitro apoptosis. Blood 1996; 87: 1022–9. 8. Foa R, Massaia M, Cardona S, et al. Production of tumor necrosis factor-alpha by B-cell chronic lymphocytic leukemia cells: a possible regulatory role of TNF in the progression of the disease. Blood 1990; 76: 393–400. 9. Panayiotidis P, Ganeshaguru K, Jabbar SA, Hoffbrand AV. Alpha-interferon (alpha-IFN) protects B-chronic lymphocytic leukaemia cells from apoptotic cell death in vitro. Br J Haematol 1994; 86: 169–73. 10. Buschle M, Campana D, Carding SR, et al. Interferon gamma inhibits apoptotic cell death in B cell chronic lymphocytic leukemia. J Exp Med 1993; 177: 213–8. 11. Lotz M, Ranheim E, Kipps TJ. Transforming growth factor beta as endogenous growth inhibitor of chronic lymphocytic leukemia B cells. J Exp Med 1994; 179: 999–1004. 12. Lebrun JJ. The dual role of TGFbeta in human cancer: from tumor suppression to cancer metastasis. ISRN Mol Biol 2012; 2012: 381428. 13. Wildey GM, Patil S, Howe PH. Smad3 potentiates transforming growth factor beta (TGFbeta)-induced apoptosis and expression of the BH3-only protein Bim in WEHI 231 B lymphocytes. J Biol Chem 2003; 278: 18069–77. 14. Saltzman A, Munro R, Searfoss G, et al. Transforming growth factor-beta-mediated apoptosis in the Ramos B-lymphoma cell line is accompanied by caspase activation and Bcl-XL downregulation. Exp Cell Res 1998; 242: 244–54. 15. Swerdlow SH, Campo E, Pileri S, et al. The 2016 revision of the WHO classification of lymphoid neoplasms. Blood 2016; 127: 2315–90. 16. Matveeva AS, Kovalevska LM, Polishchuk OS, et al. Expression profile of transcription factors in the blood samples of patients with the chronic lymphocytic leukemia. Oncology 2016; 14: 311–5 (in Ukrainian). 17. Douglas RS, Capocasale RJ, Lamb RJ, et al. Chronic lymphocytic leukemia B cells are resistant to the apoptotic effects of transforming growth factor-beta. Blood 1997; 89: 941–7. 18. Massague J, Seoane J, Wotton D. Smad transcription factors. Genes Dev 2005; 19: 2783–810. 19. Basso K, Margolin AA, Stolovitzky G, et al. Reverse engineering of regulatory networks in human B cells. Nat Genet 2005; 37: 382–90. 20. Rosenwald A, Alizadeh AA, Widhopf G, et al. Relation of gene expression phenotype to immunoglobulin mutation genotype in B cell chronic lymphocytic leukemia. J Exp Med 2001; 194: 1639–47. 21. Alizadeh AA, Eisen MB, Davis RE, et al. Distinct types of diffuse large B-cell lymphoma identified by gene expression profiling. Nature 2000; 403: 503–11. 22. Kang Y, Chen CR, Massague J. A self-enabling TGFbeta response coupled to stress signaling: Smad engages stress response factor ATF3 for Id1 repression in epithelial cells. Mol Cell 2003; 11: 915–26. 23. Wotton D, Lo RS, Lee S, Massague J. A Smad transcriptional corepressor. Cell 1999; 97: 29–39. 24. Tachibana I, Imoto M, Adjei PN, et al. Overexpression of the TGFbeta-regulated zinc finger encoding gene, TIEG, induces apoptosis in pancreatic epithelial cells. J Clin Invest 1997; 99: 2365–74. 25. Fautsch MP, Vrabel A, Subramaniam M, et al. TGFbeta-inducible early gene (TIEG) also codes for early growth response alpha (EGRalpha): evidence of multiple transcripts from alternate promoters. Genomics 1998; 51: 408–16. 26. Rosenwald A, Wright G, Chan WC, et al. The use of molecular profiling to predict survival after chemotherapy for diffuse large-B-cell lymphoma. N Engl J Med 2002; 346: 1937–47.